Give you peace of mind knowing your case is covered by a seasoned professional. Maximize your recovery because, with an attorney, your case is worth more. Get access to the best medical care to become whole again. Send investigators to collect evidence and witness statements. Uncover whether the dog had a dangerous history or habits. Hire a dog bite lawyer needed to prove your case. Create risk and leverage against the insurance company and their lawyers. Answer all your legal questions. Keep you up-to-date with your dog bite case every step of the way. Don’t hesitate to contact us. There may be a time limit to file your injury claim. You’re walking down the street one day, as you tend to go for walks in the morning in this particular neighborhood. Suddenly, as you turn a corner, you see a large dog on the sidewalk. It spots you and immediately points its tail, perks up its ears, bares its teeth and begins to growl. Before you know it, the dog is charging you. You understand that running will make it worse, but as soon as the dog gets to you it knocks you down because it’s powerful. You cover yourself as best you can until someone sees what’s happening and manages to shoo the dog away. You’ve been bitten, you are cut, bleeding, confused, terrified and in shock. Now what? You report immediately to the hospital, and you find out that you’re going to need dozens of stitches to your face and head and you’ll likely experience some scarring. Your arm is fractured and there is nerve damage near your elbow. You remember whose dog attacked you, but at this moment you’re worried about how long it’s going to take to get back on your feet and back to work, how you’re going to pay for all of this and what’s going to happen next. It’s an overwhelming situation for many, which is why people in this situation need to contact a California dog bite attorney as soon as possible. Why Hire a dog bite lawyer if you’ve been injured in an attack? The Dog Bite Law Group would like to provide you with some answers to that question below. Whenever someone endures a traumatic experience, it’s natural for that person to think that he or she is the only one who has ever been through such a thing. This can lead to feelings of loneliness and helplessness. An experienced California dog bite lawyer can help a person understand not only that he or she is far from alone in this situation, but that attorney can also help the injured person understand how the legal process works. This foundation of knowledge often makes it easier to process all that’s happening. An experienced California dog bite lawyer can define the value on every type of loss, including those that will likely be incurred in the future. This will minimize the chance that the injured person will unnecessarily face costs without financial help. There are many other pieces of information that could be evidence, and it takes legal experience not only to gather and organize this evidence but also to understand which pieces are relevant and which are not. They deal with these scenarios every day. They are skilled at limiting the financial liability they face. They understand how to deal with an injured person. They have vast resources at their disposal. They employ highly-skilled defense attorneys when necessary. Simply put, this is not a fair fight. When an injured person chooses to hire a dog bite lawyer, that attorney will manage all communications with that insurance company and the other side overall. That eliminates the concern that the injured party will make a mistake that harms his or her legal position. In general, the vast majority of California dog bite attack claims wind up settling before they ever make their way into the court system. That’s because litigation is expensive for the defense and often times it makes more financial sense to settle the matter and close the file. However, negotiating a settlement is also a skill that is honed by way of experience. A California dog bite lawyer will understand, as stated above, the value of the claim and work to obtain that value as quickly as possible. A common tactic employed by insurance companies is to basically “dare” an injured individual to file a lawsuit against it. Many times, the person who was injured in the dog bite attack will choose to accept a low-ball offer as opposed to getting into that complicated process. When an experienced California dog bite lawyer is involved, particularly one that has earned a strong reputation, the defense understands that the threat of litigation is real. That changes things for the better for the injured person and many times improves the possibility of reaching a fair and just settlement. One of the most overlooked aspects of any personal injury situation is that even after a settlement is reached or a judgment is won, the injured party still needs to collect those funds. Complications can arise in that regard, particularly if the defense engages in any stall tactics and the like. A California dog bite lawyer will see to it that the funds earned from these cases are ultimately collected and paid out appropriately. That’s a lot for anyone to handle, which is why no one in this position needs to try to navigate through a complicated legal scenario without experienced professionals who possess a distinct advantage with regards to knowledge and tactics. Someone in this position needs to focus on the items listed above and allow someone else, such as an experienced California dog bite lawyer, to handle the legal aspects of the situation. 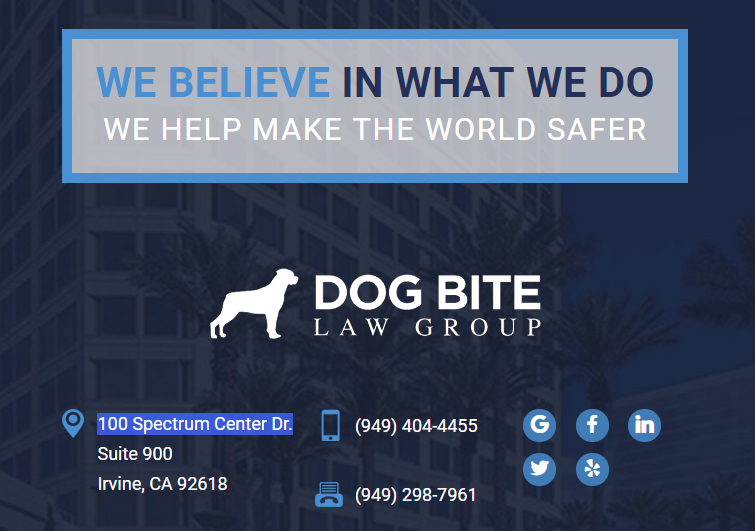 For all of these reasons and more, you need to seek the help of our Irvine Dog Bite Attorney at the Dog Bite Law Group as soon as possible if you have been injured in an attack. Contact the firm today to schedule a free initial consultation.